We got a requirement to denote an unsaved record with * in a session. User clicks ‘Create Task’ link from Agent Script. System should display * on ‘Task’ Tab until it gets Saved. It’s very easy to achieve using ‘Scriptlet’. In one of our requirement, we had to create a new “Incoming Phone Call” activity against the calling ‘Contact’, whenever a call received. In this article, I am using “CTI Simulator” (Download) to generate an incoming call. If match found, open the ‘Contact’ in USD. 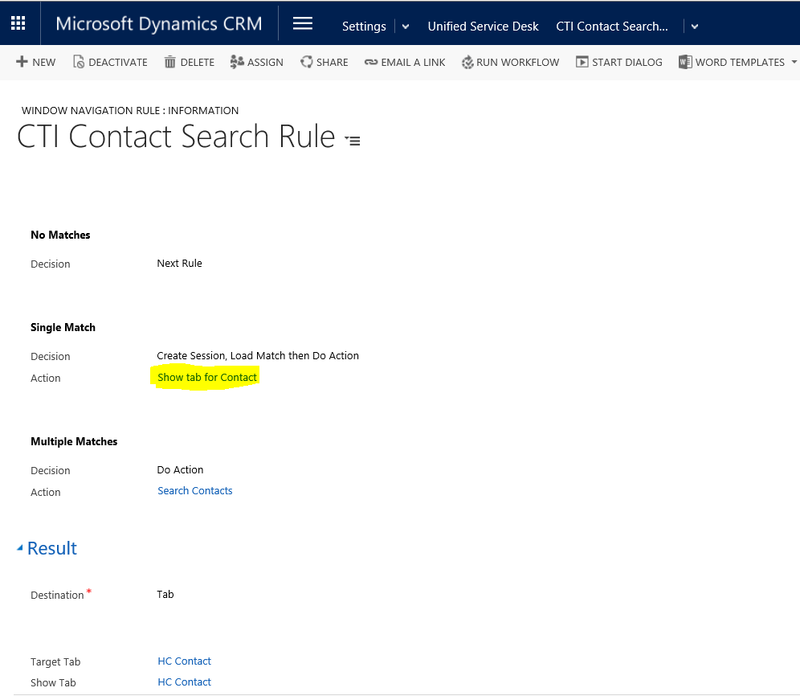 In USD configurations in CRM, create a “Windows Navigation Rule”, to open a ‘Contact’ record, if there is a Contact with incoming phone number. In the Action Call “Show tab for Contact”, we set focus on ‘Contact’ which was opened in USD. Now coming back to our requirement, we need to create an “Incoming Phone Call” for the matched ‘Contact’, which got opened in USD. To achieve this, create a Sub Action Call “AC Create Contact Inbound Phone call”, under “Show tab for Contact”. 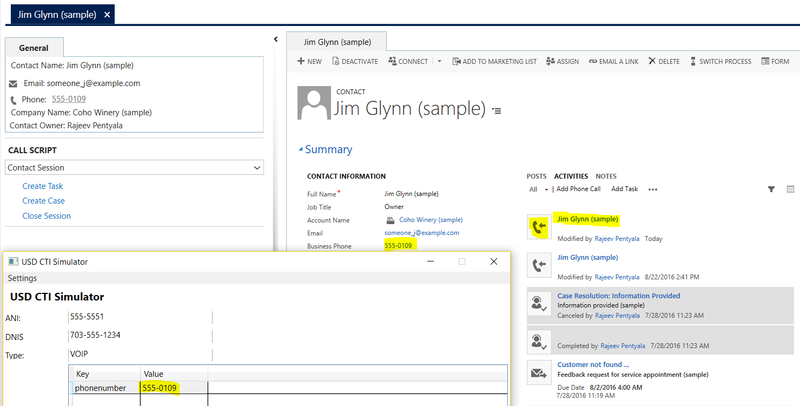 In “AC Create Contact Inbound Phone call”, define a “CreateAction” to create “Phone Call” copying information from “Contact”. 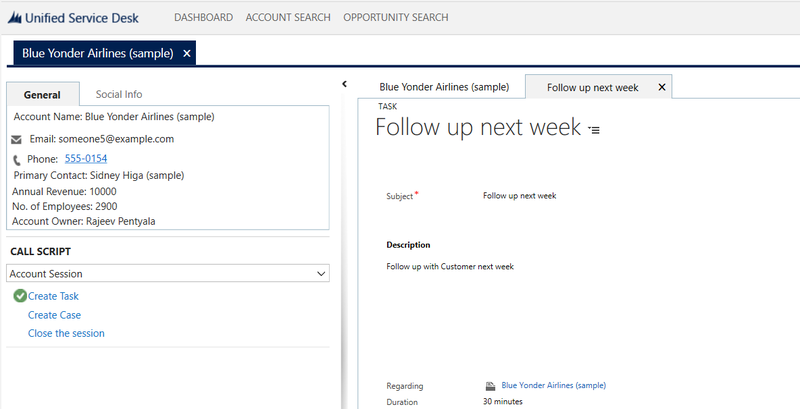 The ‘AC Create Contact Inbound Phone call‘ action call triggers after ‘Show tab for Contact‘ and a new ‘Phone Call’ gets created. I was exploring USD and tried below scenario. Add a ‘Create Task’ Agent Script Answer. On click, open Task form in a new Tab, pre-populated with ‘Regarding’ lookup with Account. I had a tough time to set ‘Regarding’ look up with ‘Customer’ using ‘New_CRM_Page’ UII Action. I could achieve with ‘Navigate’ UII Action. Exclude “navbar=off&cmdbar=false” from URL, if you want CRM tool bar on the new ‘Task’ form.